If, like me, you’re suffering from the dispiriting ennui of a January detoxification regime, crack open a bottle and dig into that bag of crisps again, as I have a plan. You could detox your car instead. Remember those carbon-offset schemes that were all the rage a few years ago? This is similar, but involves switching a carbon-emitting runabout for an electric car running off the household mains. As a result of driving the Renault Zoe for a few days, I can boast that my little slice of England is a marginally cleaner place. There are a few holes in the theory, I’ll admit, but I felt rather cleansed as I bimbled about the lanes in near silence, wafting along with only a few watts to send me on my way. 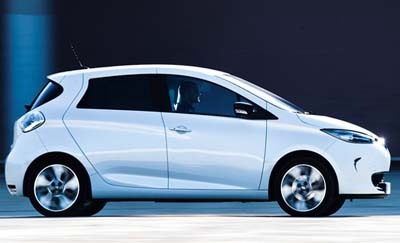 The Zoe is the best electric car on sale. I’ve driven a few of these contraptions over the years, some of which Heath Robinson would have scoffed at, but the overriding impression of most of them is that they’re trying to do too much with the limitations imposed on them by their short battery range. As with everything, you have to apply the rule of fitness for purpose. After all, you wouldn’t run a shire horse in the Derby or make swimming trunks out of tweed. It’s the same with these electric cars. What’s the point of a family hatchback that only does 80 miles? Although the new BMW i3 is a magnificently designed thing and the Nissan LEAF a technological tour de force, spending £20,000 or £30,000 seems a waste of a good diesel Volkswagen Golf. The Zoe, however, is a cute ‘supermini’ that looks like a robot mouse. After the Government has given you a £5,000 grant, it costs the same as a Ford Fiesta, but produces about half the emissions when being topped up with electricity. This makes it an ideal second or third car, a machine for hopping to the shops, doing the school run or leaving the pub. Clearly, it’s not the thing for driving to John O’Groats, unless you’ve got a day or two spare.But, if you have the right kit, it charges to a useful level in half an hour and Renault will install a free charger for replenishment at your house within three hours. Driving the Zoe is fun. It whistles along quickly thanks to an ins-tant shove from the motor, it handles pretty well and feels robustly built. Perhaps the biggest problem isn’t range, but how quiet it is to other road users-I followed a couple walking blissfully hand in hand down a quiet side street and it took a beep to eventually move them, which made me feel like a high-tech stalker. You can switch on some contrived noises to warn people, but they don’t seem very effective.